None of the conventional approaches to get home systems in use today have the ingredients to meet our expectations. They all have shortcomings which we feel make them unacceptable. This led us to develop our get home sailing rig which in combination with a powerful dinghy tied alongside for close to harbor propulsion is a reasonable compromise. Now, with the swim step extension, there is another option which makes the FPB 64 get home system even better. To begin with, any get home system involves tradeoffs. The biggest is its impact on the surrounding systems, their layout, and accessibility. If you create maintenance headaches with your everyday propulsion gear by adding the get home system, you may be insuring the need to use the back up system at some point in the future. Then there is the issue of distance. Are we talking completing an ocean passage or making it to anchor a few miles away? Assuming good maintenance procedures and 250 to 300 hours of break in time on the propulsion system, the risk of the engine failing in a manner that is impossible to correct, is minimal. Which brings us to damage to the drive line from debris. Although the prop is protected by a full skeg, and Wind Horse has yet to suffer even a small prop nick from ice or wood, this is our biggest concern. The two conventional approaches to get home, an offset second prop or an auxialliary drive on the main prop shaft, do not provide an answer to this form of damage. Our get home sail has been the best approach to dealing with a major propulsion failure to date. It gives us long distance capability without using a damaged prop or a compromised fuel supply. However, this is not a 100% solution. It takes time to rig, is limited in usable wind angle, and would not be useful for close in maneuvering – which is where a dinghy tied alongside comes into play. The swim step extension offers a new option. We now have space for a hydraulically powered prop sitting aft of the rudder. Power is supplied by a PTO off the generator. This prop location is protected from debris by both the main propeller skeg and the rudder. The combination of the genset PTO driven second prop aft of the rudder and the get home sail gives us a package that addresses both long and short distance needs. 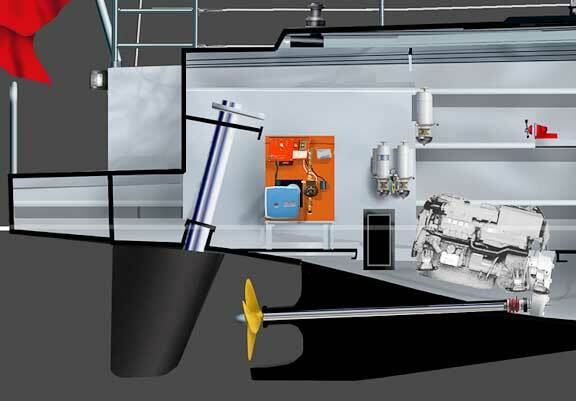 With the hydraulics running aft, under the swimstep, the impact on the rest of the engine room is minimal. To get enough power onto the emergency prop the genset needs to be upsized to a 16/17kW model which gives us between 25 and 30HP at the PTO. This generator is slightly larger and heavier, but easily accommodated in the engine room. The larger genset eliminates the need to manage AC electrical power usage. There would be two props from which to chose for the get home system. A folding prop for minimal drag which would normally be in place, and a fixed three bladed wheel which you would switch to for longer passages. The fixed wheel is likely to put as much as a third more power into the water than the folding propeller. Smooth water, calm wind performance is likely yo be in the range of five knots. 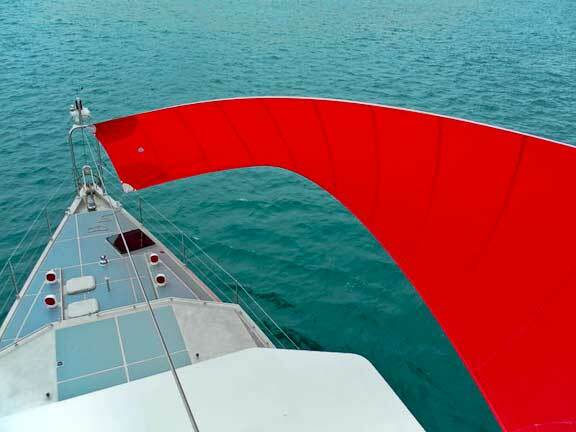 Combined with the get home sail we think downwind passages averaging 75 to 100 miles a day are possible. For more information contact Sue Grant: Sue.Grant@Berthon.Co.UK. This entry was posted on Tuesday, January 11th, 2011 at 2:07 pm and is filed under FPB 64 Updates. Both comments and pings are currently closed. diesel hors bord ? fenwick ou chinois?. Currently we are planning on using a saildrive, driven hydraulically off the generator. Will it be possible to power the stabilizers off the PTO at anchor in less than optimal seas? Or will it be a separate hydraulic system? Obviously there would be some redundancy advantages over an integrated system, but also some maintenance, complexity risks. I love the addition of a get home system though. While I respect the sails, and would be pleased to have them due to their independence from diesel, I like that this system could be activated quickly to avoid problem if you’re engine quits in a busy harbor. Our preference is to keep the two hydraulic systems isolated. This is a more reliable approach which is the key decision point. Our booms and flopper stoppers are also far more effective than using the stabilizers at anchor. Is it possible to have a sail-drive type unit that can rotate? If so you could turn it 90 degrees for thrusting the stern. A rotating saildrive is possible but not nearly as simple or reliable as one that is fixed. Given the huge rudder on he 64, its proximity to the prop, and 40 degrees+ angle, we have a 200HP thruster already.